On Sunday, July 8, 2018, at 9:55 PM, Santa Ana Police officers attempted a traffic stop on a vehicle in the area of 3400 W. 1st Street for a traffic warrant in Santa Ana. The vehicle evaded and a pursuit ensued. The pursuit ended in the area of Bolsa Ave. & Magnolia St, in the City of Westminster, as a result of a traffic collision involving the suspect and an uninvolved motorist. At the culmination of the pursuit, an officer involved shooting (OIS) occurred. A weapon was found at the scene, however no officers were injured. The suspect was pronounced deceased at the scene. The uninvolved motorist sustained injuries and was transported to a local hospital for treatment. 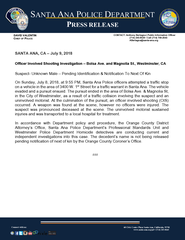 In accordance with Department policy and procedure, the Orange County District Attorney’s Office, Santa Ana Police Department’s Professional Standards Unit and Westminster Police Department Homicide detectives are conducting current and independent investigations into this case. The decedent’s name is not being released pending notification of next of kin by the Orange County Coroner’s Office.